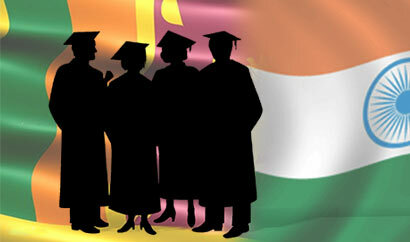 Indian government has offered a large number of scholarships for Sri Lankan students to follow undergraduate, postgraduate and PhD degrees in some of the leading universities in India, a Press Release issued by the Indian High Commission in Colombo stated. All government funded ICCR scholarships cover full tuition fees for the entire duration of the course. In addition a monthly sustenance allowance, accommodation allowance and annual grant for books and stationeries will also be provided. The scholarship programme is included full health care facilities, air fares and annual grant for education tours to visit various parts in India, apart from several other auxiliary benefits. The Government of India selects only meritorious Sri Lankan nationals for award of these scholarships. Selection of candidates is done in consultation with the Ministry of Higher Education, Government of Sri Lanka. Therefore the Ministry of Higher Education of Sri Lanka has invited applications from eligible candidates. The last date for submission of application forms for undergraduate courses is on February 10th and for post graduate and research/PhD courses is on the 20th of February 2013. The application forms can be down loaded from the website of Ministry of Higher Education at www.mohe.gov.lk. Interested candidates can also visit the website of High Commission of India in Colombo for further details on the scholarships. · Nehru Memorial Scholarship Scheme: Hundred (100) slots are being offered under this scheme which covers all Undergraduate courses (except Medicine) including Engineering, Science, Business, Economics, Commerce, Humanities and Arts. · Maulana Azad Scholarship Scheme: Fifty (50) scholarships for Masters Degrees courses including Engineering, Science, Economics, Commerce, Humanities and Arts. However, preference would be given to the fields of Engineering, Science and Agriculture. Medicine subject is not included in this scheme. · Rajiv Gandhi Scholarship Scheme: Twenty five (25) slots for Undergraduate courses in the field of ‘Information Technology’ leading to a B.E or B.Tech Degree. · IOR-ARC Scholarship: Two (02) slots for Masters Degree in all disciplines including indigenous medicine. MBBS/Medicine is not included in this scheme. · Commonwealth Scholarship Scheme: Five (05) slots for Masters and PhD Degrees in all subjects excluding Medicine. · SAARC Scholarship: Two (02) slots for Masters and PhD Degrees in all subjects except Medicine.